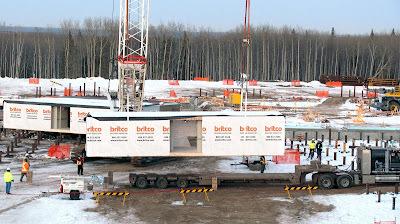 New jobs could help bolster the local economy in 2013 as Britco has landed two $100-million contracts to build housing for workers on a multi-billion-dollar hydro project in the province of Manitoba, Canada. The two-phase, $207-million contract will see 2,000 rooms of accommodation built for those involved in the construction of the $6.2-billion Keeyask Generating Station Project. The rooms will be manufactured at Britco's two plants in Agassiz and Penticton in British Columbia. In the first $101-million phase, set to be completed by June 2014, Britco will provide 500 dorm rooms as well as a gymnasium, a recreation centre, water treatment facilities and kitchen and dining areas. In the second $106-million phase, Britco will build 1,500 rooms for the workforce accommodation complex. Britco did not say how many local jobs the contracts might generate, but the company did say growth is likely. "We have been very fortunate that during the financial turmoil world economies have experienced over the past few years, we were able to expand our workforce significantly in both 2011 and 2012," said Britco executive vice-president Chris Gardner. "In terms of job growth in 2013, we anticipate something in the range of approximately five per cent to 10 per cent."